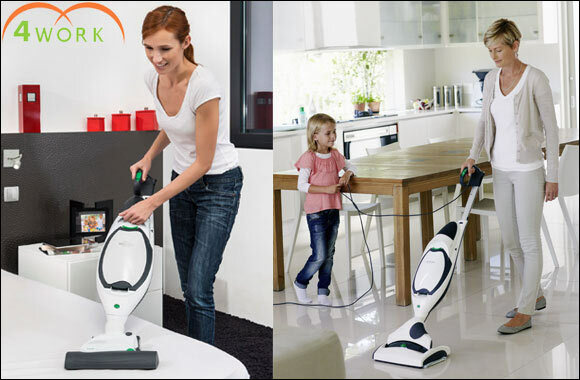 INTRODUCING the ultimate deep clean for your home with 4work’s Kobold by Vorwerk vacuum cleaners – giving you a cleaner, healthier environment for you and your family. The innovative products range from super efficient all in one power systems, to nifty handheld vacuum cleaners, to intelligent robots that clean when you’re not at home. Kobold cleaners are designed and made in Germany and provide a one stop solution that will banish, dirt, sand, dust mites and pet hairs in the trickiest of places – perfect for sand-ridden, busy homes in the UAE. What’s the secret? The Kobold is more than just a vacuum cleaner, as it cleans the entire home and gets rid of the dirt and dust mites you don’t see that contribute to allergies. Even with all these features, the Kobold System Power Unit weighs only 3kg making light work of cleaning and its sophisticated, innovative design means that not only the Kobold is highly efficient, but it also looks sleek and stylish and is a pleasure to use. Since its 1930 invention, over 80 million Kobold products have been sold worldwide and the company has won awards for its quality and design, so it will come as no surprise that the average lifespan of a 4work Kobold appliance is 13 years making it a worthwhile investment for any home. Gerlinde Krupp, 4work’s CEO comments: “We are passionate about creating cleaner, healthier and happier homes and 4work’s Kobold is the perfect addition to any household in the UAE. “With allergies and dust and sand being a real problem here, our state of the art solutions mean that you can tackle all areas of your home including mattresses, rugs, carpets and other surfaces with ease and all with the knowledge that your home has received a deep down, thorough clean. Kobold products start from just over AED 3,000 and potential, interested customers are invited to have a free home demonstration prior to purchase so they can see the results for themselves first.